Pepple's is a cute, small neighborhood spot: the kind of place you walk to on a Sunday morning, dog in tow, and greet all of the regulars and staff, where everybody knows your name. Never before have I seen such a diverse mix of diners in a vegan restaurant--old, young, families, friends, and all colors under the ethnic rainbow--everyone happy, loud, and eagerly attacking their plates. In fact, there was quite a line out the door my entire time there. I guess everyone wants some vegan brunch in their lives. The staff is interesting, to say the least, and very friendly. I often saw the owner stopping by tables, talking to and laughing with the diners. 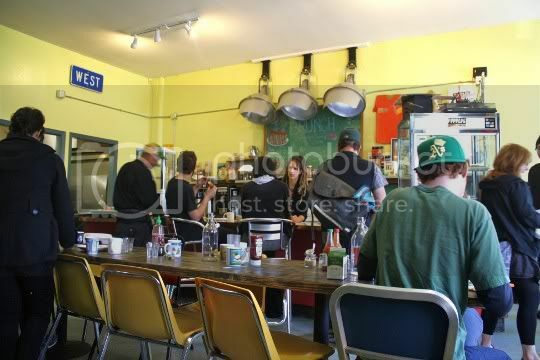 Although I've visited Pepple's brunch once before, so much has changed in the interim. The place has definitely gotten more "lived in" and more established as a true eatery (as opposed to just a bakery). 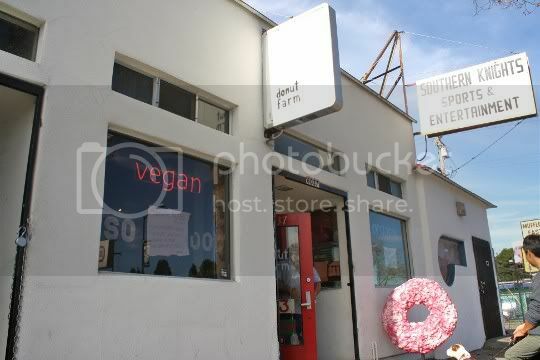 Let's start with what this place is known for: awesome vegan donuts. I'm not sure if they're baked are fried, but they all have that dense, moist, rich, cake-donut flavor and texture that is absolutely delicious. They aren't overly sweet; it's the frosting that really takes the cake. 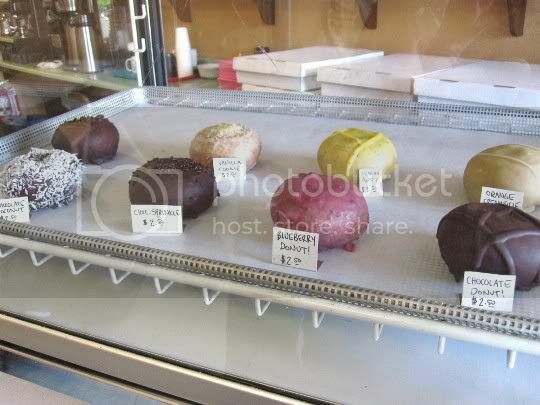 I tried the salt caramel, orange creamsicle, chocolate cookie, and green tea donuts. Each one was tender, sweet, rich, and decadent...so decadent, in fact, that it would be hard to believe these are vegan. There seems to be anywhere from 10-15 different flavors each day, so bring a friend and try them all! During my first visit to Pepple's a year ago, they just so happened to be experimenting with some off-the-menu baked goods. Yes, vegan croissants. They allowed diners to sample them, although we were warned that it was "too early to tell" whether or not they would become a staple menu item (as of now, they aren't). The croissants were hot and fresh from the oven, salty, buttery, and rich. They didn't have the traditional thin, flaky croissant crust, and they tasted more like a dinner roll...but boy were they good. 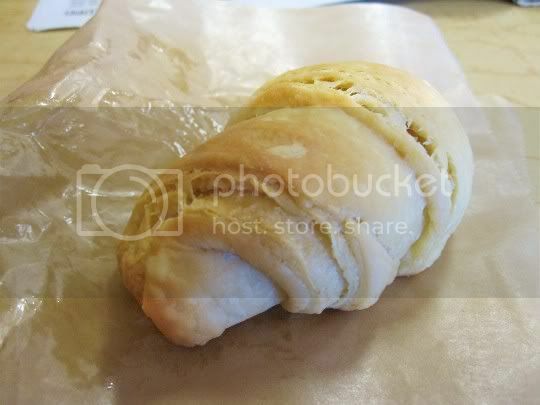 Pepple's, bring back the croissants!!! There's nothing better than a tofu scramble in the morning. Unfortunately, there wasn't enough tofu in this one. Instead, it was chockful of mushrooms, bok choy, spinach, and carrots, and very heavy on the curry flavor. Don't get me wrong, it was delicious...I just would have like more tofu. The bright yellow hashbrowns tasted more like yams than potatoes, but they were thick and hearty and slighty sweet. And then there's Dave's Killer Toast: thick, hearty, seedy, flavorful wheat bread spread with a little butter and lightly toasted. Amazing! Seriously, the bread alone is addictive. 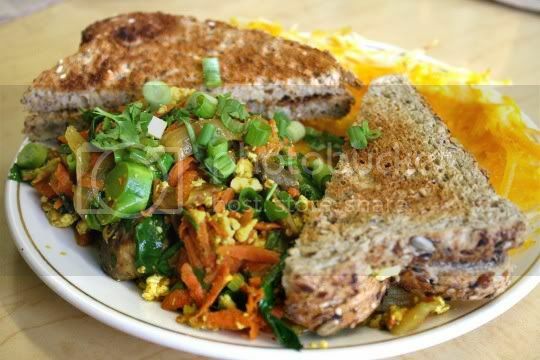 Make a tofu-veggie scramble sandwich with your leftovers (because yes, this massive amount of food yields at least another serving). Oh, and don't forget the table-side Sriracha, a must for vegan brunch. This monstrosity of a burrito was filled with crumbled tofu, pinto beans, rice, and roasted chilies. 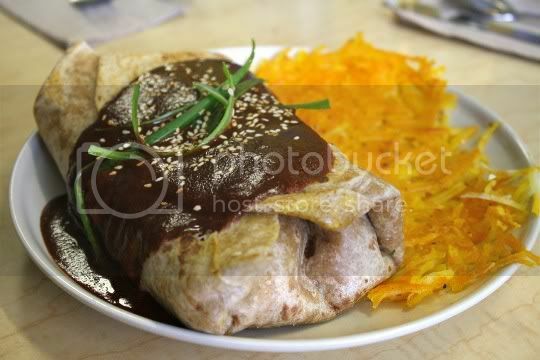 Topped with a rich, smoky, peppery mole sauce, this thing can easily feed two people. You can even add Daiya! It was super flavorful and spicy, perfect for a meal at any time of the day. 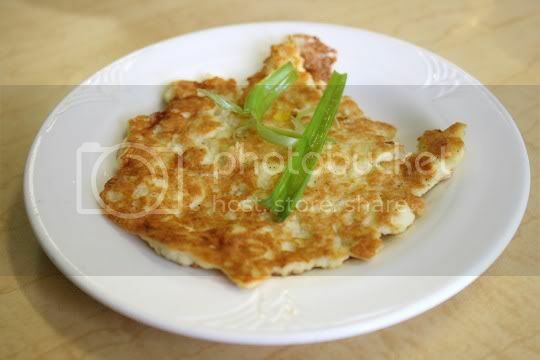 It came served with the same hashbrowns from above, but you might not be able to stomach it all! A vegan Belgian waffle, made extra hearty with ground almonds right in the batter. Nutty, thick and chewy, and extra cinnamony, this is the vegan brunch's dessert dream. There was just the right amount of sweetness, and the fresh blueberry compote on top was absolutely perfect. 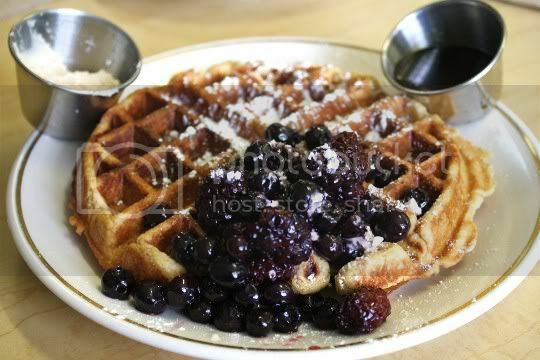 The waffle was served with a side of maple syrup, which was the perfect complement to the nutty and fruity flavors. But it was the side of cinnamony cream cheese frosting that stole the show. A little spread on each bite of waffle was pure heaven. Pepple's also has pancakes (blueberry or banana!) that I'm sure are equally as delicious. Interesting, right? I certainly didn't expect an order of sausage to look like this... But it's exactly what it looks like: a crumbled tofu patty, not "sausage." It was extremely salty, almost to the point of being inedible, unless mixed with something a little bland like the hashbrowns or toast. However, I think this would make an excellent actual tofu scramble on its own. Although it was overly salty, it did have good seasoning, and I'd take this over scrambled eggs any day (and really, isn't that what it looks like?). This tofu comes from Oakland's own Hodo Soy Beanery, which makes fresh tofu and soymilk and even offers beanery tours. Anyway, I wouldn't order this again, and would instead opt for a side of Field Roast available on the menu. Pepple's definitely brings soul to their home-cooked brunch, and let's not forget about those tasty donuts. Vegan or not, you must make this a staple in your weekend dining options. That waffle? Amazing! I'm all for having nuts, fruit, AND maple on my waffle so this beauty looks and sounds like a perfect fit.